3. Who sponsors a Squires circle? A Knights of Columbus council or assembly sponsors a circle. 4. What is the responsibility of the council/assembly in connection with the circle? an Advisory Board, who serve as the liaison between the Squires and Knights. 5. Who is on the sponsoring unit’s Advisory Board? 6. Does the Advisory Board have direct supervision of the circle? No. Direct supervision of the circle is the responsibility of the counselors, who are chosen and appointed by the Advisory Board. 7. What are the duties of the counselors? A counselor works closely with the Squires, encouraging and supporting their ideas and initiatives, but will not do their work for them. 8. How many counselors does a circle need? a father prior, usually a parish priest. Other Knights and fathers of Squires can be counselors as well. 9. What are the chief counselor’s responsibilities? leads the supervision of Squires. 10. Where do you find counselors? All counselors must be Knights. Consider men who are coaches, teachers, fathers of prospective Squires, former Squires and young council members. 11. Should the council/assembly provide financial support for the Squires? Once a circle is established, the circle should be self-supporting, through dues and fund raisers. 12. What does it cost to join and maintain membership in a circle? The initiation fee is $1.00, which goes into the circle’s treasury. Dues are determined by the circle. 13. Should a circle have a bank account? Yes, a circle should establish a savings/checking account. All circle checks should be signed by the chief Squire, bursar and chief counselor. 14. How does a circle recruit members? Every Catholic young man between ages 10-18 can be a Squire. Consider recruiting in religious education classes, in Catholic schools, through parish announcements and bulletins, and in school newspapers and the media. Don’t forget sons and grandsons of Knights. Established circles should hold membership drives and Squires should continually look to bring in new members. 15. Can a Squire remain active after his 18th birthday? Yes, if he was of eligible age at start of the program year, he can be a Squire until June 30. Once 18, he should be encouraged to become a Knight while still an active Squire. 16. Can a circle be formed in a school? In-school circles are a growing area of Squire development. Circles have been instituted in public, private and military schools, though Catholic schools are the most frequent location. School circles draw members and counselors from the school’s students and faculty. 17. What is the Squire Advancement Program (SAP)? The SAP is an activity-based program that helps Squires learn and develop as leaders. Squires advance through five progressive levels, completing tasks and gaining skills in four activity categories, and earn recognition for their achievements. 18. What are the levels and activity categories of the SAP? 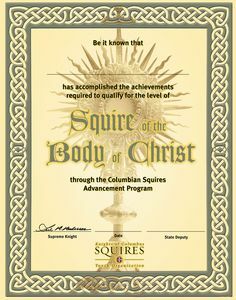 Squire of the Body of Christ. 19. What do councils receive in return for sponsoring a circle? In addition to helping mold future Knights and leaders of your Church and community, sponsorship of a Squires circle in good standing fulfills all four youth activity requirements for the Columbian Award. It also can help membership as Squires often join their sponsoring unit. 20. How can a sponsoring unit develop a good relationship with its circle? Build a good relationship through occasional joint programs, visits by Knights to circle meetings, regular reports by the chief counselor at council meetings and through publicity in council bulletins.